Showa is actually another koi variety that shares close resemblance with unique color features that make it look like a Sanke. It has 3 primary colors which are red, white and black and unlike Sanke the only difference is that the black color patch (Sumi) is more profound and appears in bigger blotch size. The fish can be obtained from pure bred between a pair of Showa but it will not necessarily mean that all the off-spring produced will be similar to their parents because the color mix might differ and change to become another variety. 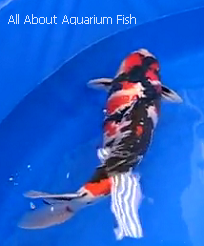 Some koi breeders prefer to cross-breed a Kohaku with a Sanke and while there are different opinions with another group which thinks that pure bred method is far more superior, however one thing for sure is that whichever method is selected, they still can be used to produce quality Showa variety. The koi fish in this group is highly sought after by hobbyist especially the Hi type because their colors are the most distinctive and attractive compared to the others. Most of the fish are judged and valued based on their colors, size and appearance. The colors must be bright and intense while in terms of size, fish that develops a strong body mass buildup can easily command a selling price that amounts to few thousands. Most people prefer to buy juvenile Showa to raise them to become adult fish because not only price is a factor but it is more fun watching them grow and develop. However one major setback is that most hobbyist learned and found out that most of these fish can actually change coloration as they develop. Some can actually lose the black coloration while others gain and the pattern arrangement will be different when they grow older. Among the most treasured is the Inazuma breed which has the lightning bolt pattern zigzagging across its body. Judging a Showa and selecting the best koi in show competitions can sometimes turn out to be very tricky because there are certain standards set upon by the panel of judges. Other than visible defects and body shape appearance, the overall pattern arrangement will also determine whether the fish qualifies for the trophy which means that the color patch must balance out each other on both sides of the body. Other considerations include first impression seen upon when you view the fish and all these can sometimes make a whole lot of difference.